‘Eating carrots makes you see in the dark’ is an commonly-used and fun way to encourage children to eat more in the way of vegetables. As we grow up, we realise that it does not really hold true because the problem with night-time is that there is no light, and no amount of dietary carrot can over come that. It is not until later that we may discover that there is a benefit in eating carrots. Specifically, that they provide vitamin A that our bodies use to make the photosensitive chemical, 11-cis-retinal, that we do need to be able to see. Despite this, further exploration is needed to understand the chemistry of how components of a carrot can be used to produce a set of photosensitive systems capable of allowing us to read a set of traffic lights. Furthermore we lose and replace cells every moment of our lives, and there is no reason to think this would not apply to cells found in our retina, nor to the photosensitive chemicals found within them. This not only begs the question of how this part of our visual sense is made, but also how it is maintained over a period of several decades. By building on previous studies of 11-cis-retinal in eyesight [1-3], Maeda et al. have started to answer these questions. The evidence reported [1-4] suggests that damaged (i.e., worn-out) 11-cis-retinal is recycled in the retina. This is obviously a frugal and practical method for managing this system: animals that have long times between meals or are under famine conditions will suffer less damage to their vision than if they required it from every meal. This important adaptation allows predators to see prey and run after it, despite not having eaten for even several months (e.g., the crocodile), and also enables prey to see well enough to observe a predator and mount an escape. Moreover, many of the oxidation products of 11-cis-retinal in vivo are quite toxic to the visual system. Thus a fast and efficient system to minimise their presence is significant in retaining a working system. However, the structure of 11-cis-retinal (Figure 1) presents a serious thermodynamic problem to this sort of recycling system in vivo. 11-cis-retinal does not dissolve in water or self-assemble and thus cannot be metabolised in a similar way to glucose or a lipid. So, two possible approaches to the problem are therefore either to make 11-cis-retinal soluble in water, or to make it self-assemble. The latter is basically the approach taken in biological systems, using a commonly found lipid, phosphatidylethanolamine (PE). A condensation reaction between 11-cis-retinal and PE produces a Schiff base (Figure 2) that ensures that the 11-cis-retinal is situated on the membrane’s surface and physically available for repair by cytosolic enzymes. Figure 2. The condensation reaction between 11-cis-retinal (bottom left) and phosphatidylethanolamine (PE, top left) that is located on the inner surface of a membrane. The product of this reaction is known as a Schiff base (right). Typically, the retinal that forms the Schiff base will be partially oxidised, and thus in need of chemical modification to return it to functional 11-cis-retinal. Though the placement of 11-cis-retinal on a membrane is important in reducing a thermodynamic barrier to recycling 11-cis-retinal, like all biological processes, it can go wrong. A certain type of age-related retinal degradation is well characterised. Sufferers are left in a dangerous position, physicians with a problem to solve, and drug companies with an entrepreneurial opportunity. The data from Maeda et al. may contribute to improving the situation in which sufferers find themselves. A variety of drugs possessing a primary amine ( NH2) group, the same one as that in the PE that takes part on the condensation to give the Schiff base (Figure 2), have been tested. Drugs in general are typically chemically distinct because they can both dissolve in water but also pass through membranes. Thus a drug molecule with a primary amine group could both condense with 11-cis-retinal (in precisely the way that PE does) and remain in the aqueous phase. This would allow 11-cis-retinal to dissolve in the cytosol and be repaired in a system in which the lipid method for this did not work normally. Data from Maeda et al. 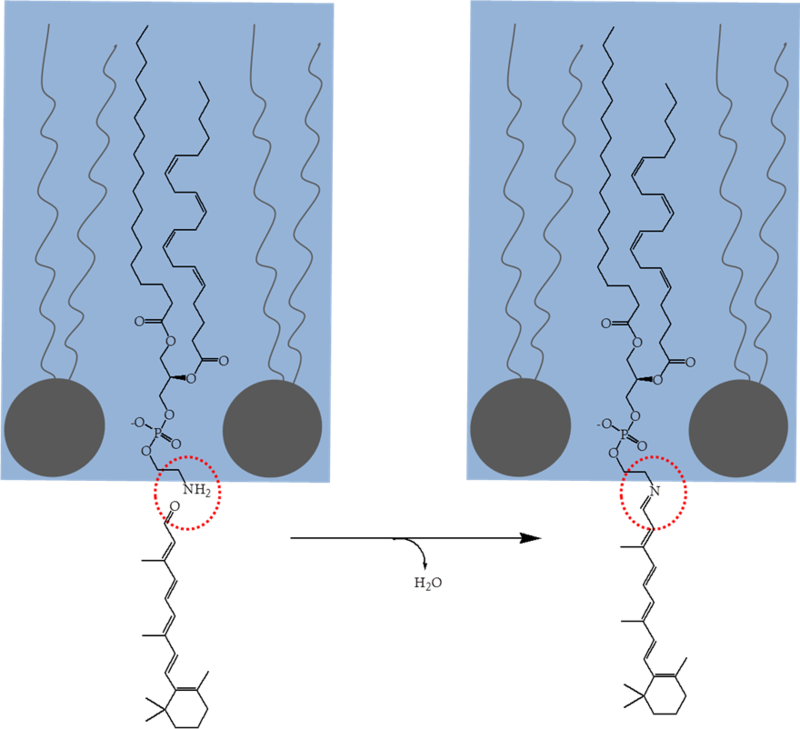 suggests that there are several possible chemotherapies based on the concept of an amine-containing drug that can condense with 11-cis-retinal and thus make it soluble and available for recycling/degradation, however clinical trials have yet to take place. Y. Tsybovsky, R.S. Molday, K. Palczewski. Adv. Exp. Med. Biol., 2010, 703, 105–125. R.S. Molday, K. Zhang, Prog. Lipid. Res., 2010, 49, 476–492. M. Zhong, L.L. Molday, R.S. Molday, J. Biol. Chem., 2009, 284, 3640–3649. A. Maeda, M. Golczak, Y. Chen, K. Okano, H. Kohno, S. Shiose, K. Ishikawa, W. Harte, G. Palczewska, T. Maeda, K. Palczewski, Nature Chemical Biology, 2011, 8, 170-178. doi:10.1038/nchembio.759.